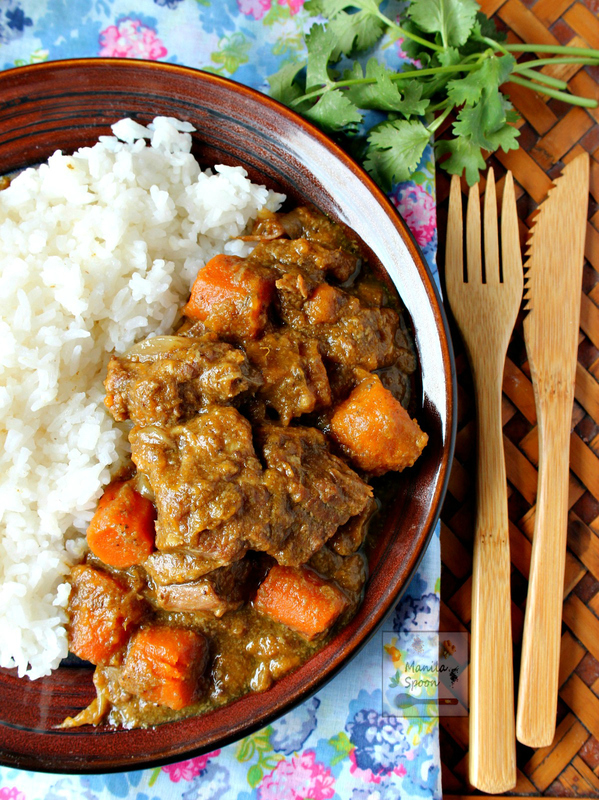 A hearty slow cooker stew with melt-in-your-mouth tender beef chunks in creamy coconut sauce flavored with curry powder and other spices. 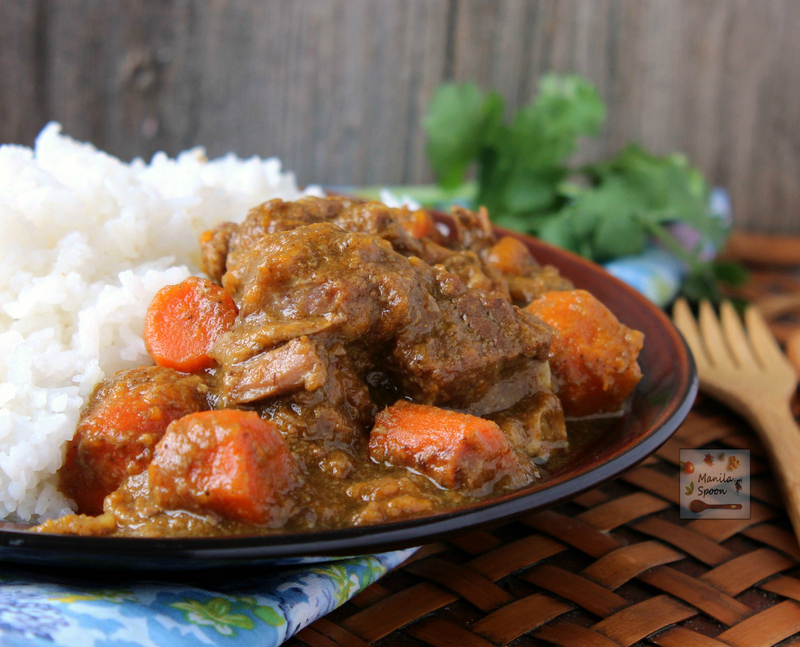 SLOW COOKER COCONUT CURRY BEEF STEW – deliciousness in every mouthful! Fall is the time to make delicious comfort food that will help us cope with freezing cold winter nights. I often experiment on different types and flavors of beef stew so all throughout the season we don’t get tired of the same old, same old recipe. This time, I fancied something with a bit of an Asian kick. For convenience I used the slow cooker so it’s just a matter of dumping all the ingredients in and then it’s ready when we are. We used some curry powder and other spices to add flavor to the stew and also added some coconut milk for that touch of creamy goodness. With melt-in-your mouth tender beef chunks after a long slow cooking, I can honestly say – this dish truly tickled our taste buds and we enjoyed each delicious mouthful. The bonus, it’s even better the next day – assuming there’ll be some left-over which may be doubtful if you’re into curry and rice! Enjoy! Liberally season the beef cubes with salt and pepper. Melt the butter and oil using medium-high heat (but not smoking hot) in a large and heavy bottomed pan. Brown the cubed beef in batches. Place the meat in a large platter as you cook. Place the onion slices on the slow cooker and top with the browned beef. Add the sweet potatoes and carrots. In a bowl, whisk together the coconut milk, curry powder, spices, sugar, fish sauce and a little salt and pepper. Pour over beef and vegetables. Cook on low for at least 8-10 hours or about 5-6 hours on high. Length of time varies depending on your crock pot. Adjust seasoning if necessary adding a little more sugar to balance the flavors and some salt and pepper, to taste. Serve with freshly cooked Jasmine rice! If im going to use pressure cooker. What is the mechanics and the cooking time? Thank you! Hi Sheila, I haven't tried this in a pressure cooker but your manufacturer may have some info on how long to cook the beef. Perhaps that would help. This looks so sumptuous! How would you prepare this without the slow cooker? Can you get a similar result in less time with regular cooking? Either way, I'll have to try this! I love my slow cooker and what a yummy recipe! Easy weeknight meal!!! I cannot live without my slow cooker Debra! Thankful for it!!! Yum!! I love curries AND slow cooker recipes. This looks wonderful! I LOVE this. I so rarely see curries made with beef and this one makes me gleeful. I agree with you, they're most made with chicken but once in a while I like to use beef instead. Thanks, Michelle! You had me at beef and curry. The slow cooker is just a bonus.Now I just have to go buy some fish sauce! Fish sauce makes everything yummy as far as I am concerned! 🙂 Hope you enjoy it Jerry! This looks amazing! What can i substitute for the fish sauce tho? It's not a favorite around here…. You can sub with soy sauce or worcestershire sauce to taste though the flavor will taste a little different but should still be yum! Thanks for asking! About 6 more or less. Hope you like it! So easy and so delicious! I prepared it in my oven (2hrs on low) and it turned up perfectly tasty 🙂 Thank you! So glad to know that! Thanks! Hello, What kind of curry powder did you use? Medium spicy and just the plain red but feel free to use your favorite one. Making today on a snowed in day. Cannot wait! Can't wait to make this! What size coconut milk and is it the only liquid used? The usual 14 oz can coconut milk and that's the only liquid I use though you can add a little water if you want it less thick. Thank you for this recipe. It was the first recipe I tried in my new crock pot. My husband does not do sweet potatoes so I used two small Yukon Gold, and I think it was fine. Mine certainly turned out more yellow than yours – my comment to the family was that "It didn't look like her picture at all!". I also thickened it at the end with a slurry of flour and milk. Making this tomorrow, but wondering if I can use yellow Curry powder as I can't find red curry powder here in Australia? Yellow Curry powder is certainly fine, Michelle. Hope you enjoy this! Thanks! Just stir it in the beginning or at the end but not while cooking or you will lose heat. It should be fine and hope you enjoy it! omg turned out so delicious!! you're a genius! Thanks Again! Made this yesterday, watched football and had a delicious dinner. Thanks! You can use either but please note that depending on the brand of curry paste – it could be spicier than the curry powder so please adjust accordingly. Hope you enjoy it! 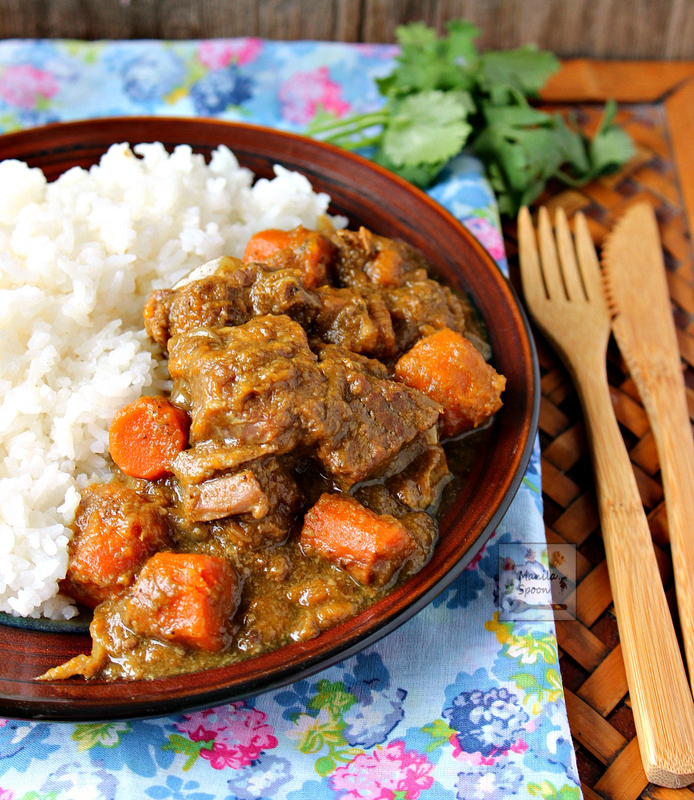 I love this beef and curry slow cooker recipe!! I have a beef and barley stew that is hearty and delicious. In my slow cooker, the sauce doesnt cover the ingredients. Does that matter? Im just wondering if its going to dry out. It should be fine, don't worry. It won't have too much liquid but it won't be dry. i want this so bad now…too bad i have a chicken in the oven already. tomorrow I guess. You can replace with worcestershire sauce, soy sauce or simply salt. Simply adjust to taste. Thanks! Can't wait to try this and when I do, I'll be using fish sauce. The people who scrunch their noses at it are often the same people who actually love some other thai, filipino, or other asian dish that contains it. It's is in SO many asian dishes. Just give it a try folks! Fabulous winter warmer – beautiful flavors – I added a bit more “heat” to it as first time was fairly innocuous and a few other spices such as garam masala and some tomato passata as well. Finished it off just before serving with a touch of double cream stirred in – serve with naam (I know it’s not an Indian dish but hey Fuzion) as well as rice and a bit of mango chutney on the side – awesome ! I am not great with measurements when it comes to salt and pepper. I either put too much or too little. How much salt and pepper (tablespoons or teaspoons) would you recommend for this specific recipe? I just need a starting point. This already has fish sauce and if you’re using it then it may be enough. It’s actually not that hard, just use your taste buds — I always taste while I am cooking until I am happy with it. If you’re not using fish sauce or soy sauce for seasoning, then begin with 1 teaspoon salt and taste then adjust as your taste buds desire. Hope that helps. You certainly can. Just adjust the seasoning to taste. It should freeze ok. Mine is always gone so there’s no chance to freeze left-overs. Thanks! Does the meat need to brown on the stove first, or can this be made like a “dump meal” in the crock pot? For depth of flavor, I would suggest browning it first. It’s worth the extra step. But it’s up to you. I just finished making this recipe and it turned out amazing! I used a crock pot for the first time, nervous because all the veggies was piling up and worried there might not be enough sauce. Hours went by, the vegetables softened up and went down and I was able to see the sauce. My entire house smelled so good!! Thank you for this recipe 🙂 I 100% recommend. I am so happy you enjoyed this Linda!! Thanks for letting us know. This makes its own sauce as it cooks so it’s not a problem at all. Thanks!! You can use whatever beef part you want, I use beef chuck roast because it has enough fat and that adds to the taste.